isa Bolter was known to say that the key to her successful marriage was never seeing her husband, Brian. He worked evenings as the main anchor at Channel 5 in Washington, DC, and she worked during the day at the Comptroller of Maryland’s office in Annapolis. For them, the schedule worked. If they were told 15 years ago that, in 2016, they would be working side-by-side every day, they would have laughed. To their surprise, the Bolters have gracefully avoided stepping on each other’s toes since July 2011, when they opened Red Red Wine Bar on Main Street. 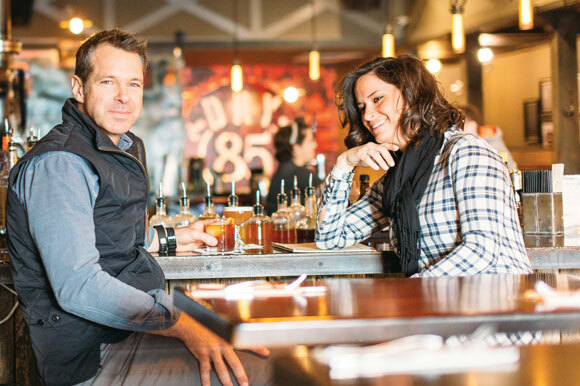 It was their first restaurant endeavor, but not their last: on New Year’s Day 2014 they opened Dry 85, just a few doors up from the wine bar. Never did they think that they would be restaurant owners, but when Brian reached his twentieth year in the television news business and saw the industry continue to struggle, the possibility of a job relocation loomed. Lisa, a Maryland girl through and through, felt that leaving Annapolis was out of the question. 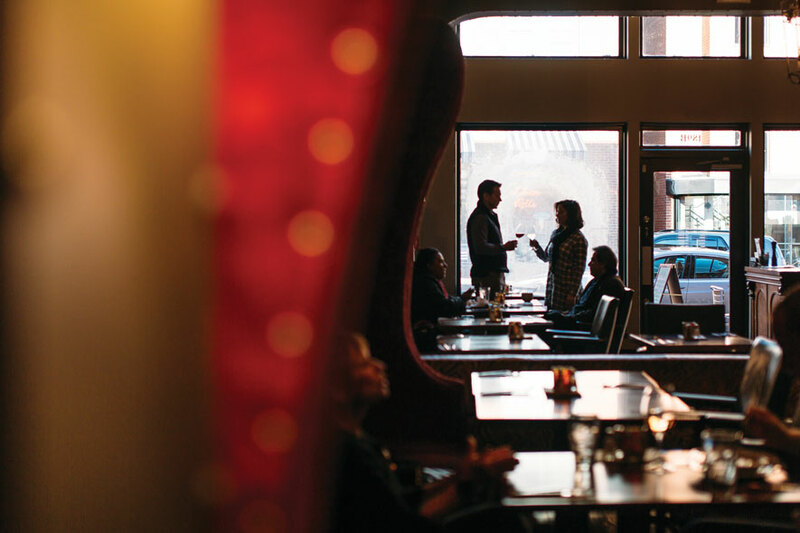 A speakeasy and a wine bar may seem like a his-and-hers business venture, but each space is just as much Brian’s as it is Lisa’s. 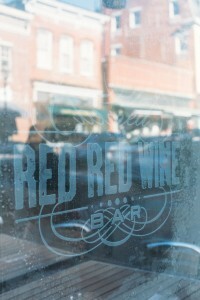 Brian is to thank for making Annapolis one of the first cities in the Mid-Atlantic to have wine and moonshine on tap. Lisa has mastered healthy options that silences screaming stomachs, but also created Dry 85’s Bacon Brunch. Red Red Wine Bar is far from being a cookie-cutter wine bar. Its strict no-wine-snob atmosphere is enforced by a sign behind the bar that reads, “Be Nice or Leave.” Brian calls wine “a trip around the world in a glass,” and with more than fifty wines to choose from, the spread truly backs that opinion. Sipping on a red from the Republic of Georgia or a white from Slovenia while sitting in a room that could been decorated by an eighteenth-century Victorian rock star who just finished reading Alice in Wonderland, it’s easy to forget that historic Annapolis is just outside. It’s where college friends come to chug tall boys of National Bohemian and watch football while members of the Maryland General Assembly mill around, waiting for the new legislative session to begin. Dads nibble on cheese platters, and moms slurp the remains of their bowls of the Maryland crab soup that the bartender swears is the best thing on the planet. Dry 85 is named for the 85 days in 1934 when the District of Columbia was still in prohibition purgatory (thanks to the Sheppard Bone-Dry Act of 1917) while most of America was cheering with legal alcohol. It can still feel like laws are being broken after pulling back a hefty factory door and entering into the modern-day speakeasy. Dim lights and low ceilings, sheet metal, and grey wooden beams contrast the vibrant colors and high-hanging chandeliers found over at the wine bar, but Dry 85’s drinks and meals are far from bland. Lisa creates an ever-changing southern style gourmet menu with fried green tomatoes and other appetizers, and shrimp-and-grits-type entrees that are made to pair with a glass of brown liquor or local craft beer. Drinks vary, from shots of Fireball Whiskey poured from a tap to a classic Manhattan, made with an orange twist that’s cut with such precision that it looks like a work of art. There are 150 whiskeys to sift through, with 65 bourbons, 12 beers on tap—almost all sourced locally—and 11 craft cocktails that change seasonally. Customers of all legal ages crack smiles as they order cocktails named El Chapo’s Escape or My Homie Dre and Tanqueray. Just as Red Red Wine Bar has a unique selection of wines that few people would be familiar with if not for Brian’s knowledge, skills, and palate, Dry 85 offers six private whiskey blends. Brian refers to these creations as “world-class expressions of whiskey.” And don’t forget about Pappy Van Winkle: at Dry 85, a glass can always be poured over a handmade ice ball. Error: Error validating access token: Session has expired on Saturday, 09-Mar-19 15:57:50 PST. The current time is Friday, 19-Apr-19 11:54:19 PDT.